Leftist abolish ICE protesters accused an African-American ICE officer of being a race traitor and repeatedly referred to him as a "f***ing n****r" while he was arresting their comrades. The incident occurred Wednesday near a US Immigration and Customs Enforcement holding facility in Portland, Oregon. A protester can be heard screaming “you’re a f–king n—-r to the white man,” followed by “you are a n—-r” over and over. Multiple protesters can also be heard calling him a “f–king traitor” as he attempted to do his job. “When master gives you an order you follow it,” a protester is heard screaming at the black agent. A large percentage of the Abolish ICE protesters in Portland appear to be white. It is interesting that incidents such as these receive no media attention, while every perceived “racist” phone call from a white person to police is a viral outrage machine. 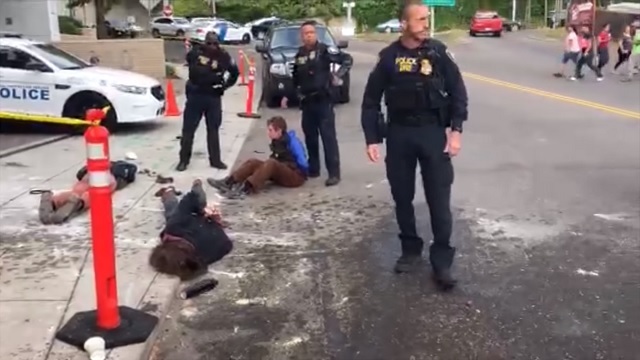 Eight protesters were arrested while blocking the driveway on Wednesday, and pepper bals and pepperspray were used after the leftists began throwing dangerous weapons at police. Note, the videos are loaded with curse words and extremely hysterical, overly dramatic screaming.